Your fleets of capital ships and starfighter squadrons are ready for action. 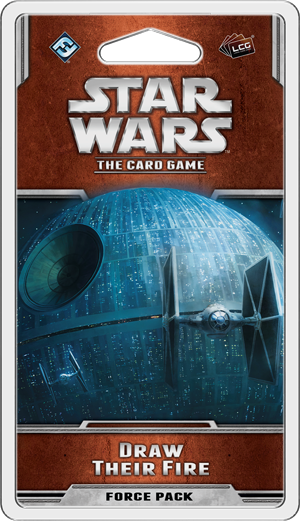 Bring the interstellar combat of Star Wars™ to life with Draw Their Fire, now available for Star Wars: The Card Game online through our webstore and at your local retailer! 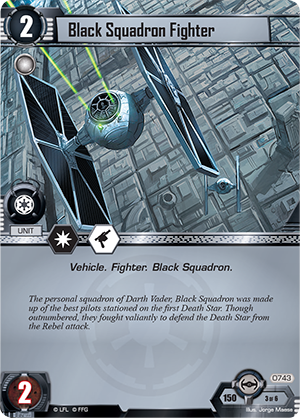 As the second Force Pack in the Rogue Squadron cycle, Draw Their Fire continues the main themes of the cycle, introducing new Pilots and Vehicles for every affiliation. Even as these new units take your battles to the stars, two additional fate cards bring new strategic depth to every edge battle. In this Force Pack, you’ll fly alongside iconic Vehicles and Pilots like Maarek Stele and the Outrider. You’ll also receive new support for Darth Vader’s personal fighter squadron: Black Squadron! Starfighters are some of the fastest Vehicles in the Star Wars galaxy. They race through dogfights at breakneck speed, and the aces with the fastest reflexes are often the ones left alive when the fight is over. Similarly, for most Fighter decks to succeed in Star Wars: The Card Game, they need to be fast, outracing the light side by destroying objectives to quickly advance the Death Star dial. With the new Imperial Navy objective set in Draw Their Fire, your Black Squadron and Fighter decks will be significantly upgrade their speed. Acceleration in a Fighter deck can be split into two parts – you need to bring a lot of units into play quickly, and you need to destroy enemy objectives as fast as you can. 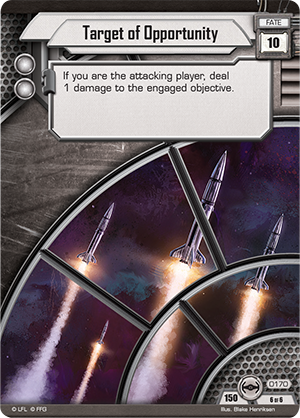 This objective set helps players with both goals, starting with two copies of the Black Squadron Fighter (Draw Their Fire, 743). This unit possesses perhaps the most important combat icon for a Fighter deck: normal blast damage. Every blast damage at your disposal increases the speed with which you can destroy the light side’s objectives. As an added boost to your deck’s speed at destroying objectives, this set includes a copy of Target of Opportunity (Draw Their Fire, 170) allowing you to deal damage to your opponent’s objectives before units even strike. When you’re trying to outrace the light side, every point of damage dealt to an objective is precious. Because of this, you’ll want to receive the unopposed bonus whenever you possibly can. Of course, your opponent is most likely doing his utmost to keep you from receiving the unopposed bonus. That’s where the Pilot DS-61-3 (Draw Their Fire, 742) comes in. More commonly known by his nickname, “Backstabber,” DS-61-3 can give your opponent a nasty surprise. By paying one resource during an engagement, you can play DS-61-3 as an enhancement on a participating friendly Fighter unit. Then, when this unit enters play during an engagement, you can deal two damage to any other participating unit, clearing defenders out of the way and bringing you closer to the unopposed bonus. 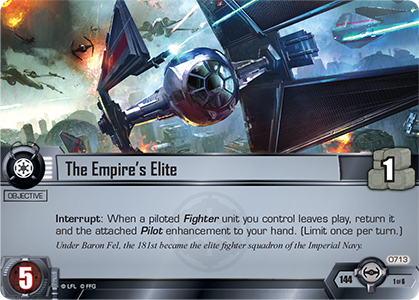 DS-61-3 may only surprise your opponent once, but if you have The Empire's Elite (Ready for Takeoff, 713) in play, you can bring him back to your hand when he leaves play, inviting you to redeploy him for even more damage. Dealing maximum damage as fast as possible is critical, but you won’t be able to damage your opponent’s objectives if you can’t play your Fighters quickly and efficiently. That’s where the two remaining cards in this objective set come in. 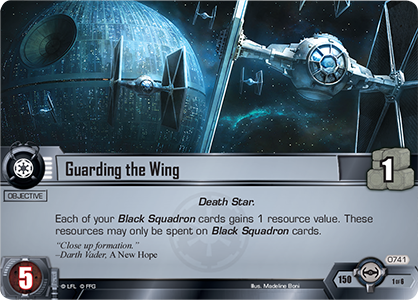 This set’s objective is Guarding the Wing (Draw Their Fire, 741), and it reads, “Each of your Black Squadron cards gains 1 resource value. 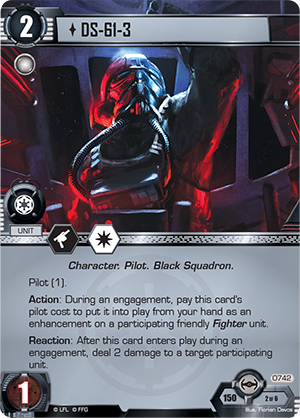 These resources may only be spent on Black Squadron cards.” By giving every Black Squadron card an additional resource, you dramatically increase your potential to bring more of Black Squadron into play every turn. Black Squadron will launch even faster with the help of Elite Pilot Training (Draw Their Fire, 744). 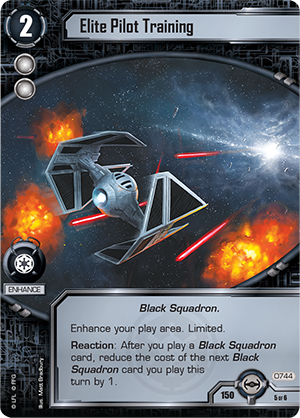 This enhancement’s Reaction can be triggered after you play a Black Squadron card, reducing the cost of the next Black Squadron card you play this turn by one. What’s more, this Reaction has no limit on the amount of times it can be triggered! Essentially, as long as you keep playing Black Squadron cards, each card after the first receives a one resource discount, allowing you to launch your Fighters faster than ever before. You may fly with Black Squadron, or you may lead The Emperor’s Sword squadron with Maarek Stele. You may choose to smuggle goods aboard the Outrider, launch torpedoes with Gray Squadron Y-wings, or follow the path of protection with the Jedi Qu Rahn. 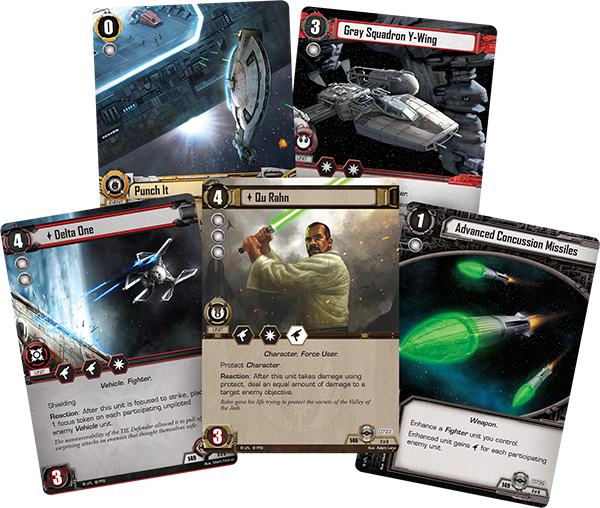 Whether you decide the fate of the Star Wars galaxy on the ground or in your starship’s cockpit, you’ll find more of the cards you need in Draw Their Fire. Pick up your copy of Draw Their Fire at your local retailer today!